The last time I wrote about my 5 favorite things for feet, it was three years ago. Since it was such a fun article to start the year, I figured it’s time for an updated list. Here are my latest amazing finds for feet. One day out of the blue, my son asked if there was anything I would like that cost under $10. I suspected that he wanted to buy me a gift, so I checked out Amazon looking for things under $10 that I might want. Serendipitously, I came across Badger Organic Peppermint & Tea Tree Foot Balm. It’s not something I would have purchased on my own, but winter was coming up, so I figured I could use some moisturizing foot balm. I showed the product to my son and waited. At some point, I realized he had forgotten about buying me a “surprise” gift. But I didn’t forget about the Badger Balm! My heels were a bit dry during winter, so I decided to try it. This stuff is fantastic. 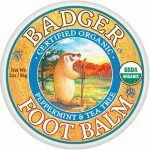 One reviewer on Amazon wrote, “This stuff works!” I was a bit skeptical at first, but having used the Badger Organic Foot Balm for about a year, I would concur with the reviewer. However, if you’ve got severely cracked feet, it might not be as strong as you need. But for general dryness over the winter, this is one of the best organic natural products that I’ve come across. We all hear the benefits of Omega-3s. These fatty acids are found in fish oil and flax seed oil too. When you have persistent dry skin, it’s often an indication that you have a yin deficiency in Chinese Medicine. Yin is considered the fluids in the body, whereas Yang is the energy and fire. Thus, if you have chronic dry skin, it’s not enough just to apply moisturizer on the surface of the skin. You also want to moisturize from the inside out. I take about a teaspoon or tablespoon every 2 to 3 days. The bottle recommends taking it more often, but I find this amount works for me. Unlike fish oil, which is quite strong flavor, the flax oil has a milder flavor. It’s not delicious, but it’s okay. This is a popular brand that you can find at Whole Foods and health food stores. I find when I take flaxseed oil regularly, I don’t even need to use the Badger Foot Balm—although I am making a concerted effort to use it regularly because my son really wants the tin when it’s finished. Oh the irony!!! OMG! I love love LOVE my Xero Prio running shoes! About five years ago, I read a book on by Christopher McDougall on barefoot running called, Born to Run: A Hidden Tribe, Superathletes, and the Greatest Race the World Has Never Seen. His story inspired me to dip my toes into barefoot running and I bought a pair of huaraches—flip flop bottom meets rope—from Xero Shoes. Back then, the “sandals” were really hippy dippy and awkward to put on. Fast forward a few years, and Xero is all grown up now. They make running and hiking shoes using their minimalist foot bed. You get the freedom of bare feet without the worry of stepping on something you don’t want to step on. 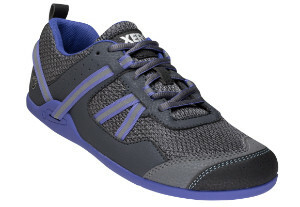 Xero shoes have a very thin tread that’s covered with a shoe casing. My foot width is on the border of regular and wide, so wide shoes are too wide and normal shoes squeeze my toes uncomfortably together. As a reflexologist, I know that bad shoes = bad feet = bad for your qi. Hence, I’ve been wearing Merrell flipflops for 90% of the year. Don’t hate me because I live in California!!! In the wintertime, I’ve been wearing ankle boots or the minimalist running shoe that I bought five years ago. Those shoes look and feel like I’ve been wearing them for five years, but unfortunately, the manufacturer stopped making them. And every time I searched for an alternate minimalist shoe, the ones I’ve found have been too narrow for my feet. Then I discovered that Xero makes “real” shoes now. I ordered a pair of their Prio running shoes, and they are the BEST shoes for my feet. They’re even better than that pair I bought five years ago when they were new. There’s enough room for my toes to spread out when I walk, and the shoes are really light, flexible, breathe well, and have a zero drop—meaning there’s no difference in height between the heel and the ball of the foot. I love my Xero shoes. I also bought their trail shoes and comfortably hiked for miles up and down some very steep hills without a breaking-in period. I walk around barefoot a lot, but if you aren’t used to this, Xero has many recommendations on transitioning to minimalist shoes. You can read more on their website. I don’t usually shop at Restoration Hardware. Actually, it’s closer to never, but they always seem to find me out when they’re selling slippers. In my top 5 favorite things for feet in 2016, I was raving about their plush foot duvets. Then, RH had these faux fur slippers on sale, and I thought I’d give them a try because the foot duvets were slippery on hardwood floors. These faux fur slippers are awesome. They’re easy to slip on and off. There’s enough tread to get a decent grip on the floor. Most importantly, the faux fur inside the slipper feels comfy and luxurious. And I just checked the Restoration Hardware website. They’re having a sale again on slippers, making these slippers an affordable foot indulgence that make you feel like you’re at a fancy spa. LOL! 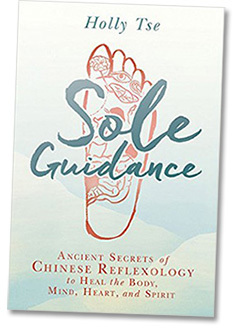 Hey, no list would be complete without a shameless plug for my book, Sole Guidance: Ancient Secrets of Chinese Reflexology to Heal the Body, Mind, Heart and Spirit. The two core reflexology practice routines in this book are fabulous for feet because they’re good for your body, mind, heart and spirit. Balancing and strengthening the body as a whole will do wonders for your feet. You can read more about Sole Guidance here, including where to buy a copy internationally, and how to find the library nearest you that has a copy of the book. Please note as an Amazon Associate I earn from qualifying purchases. What this means is if you click an Amazon link and make a purchase on their website within 24 hours, I may earn a small commission. The price is the same whether you click the link or visit Amazon directly, and I only share products with you that I genuinely like and believe in. By using these links, you help support ChineseFootReflexology.com. Every little bit helps keep this website up and running. Thank you Kindly for your support.